About 100 years ago, Hiram Manville transformed some of Pleasantville’s most beautiful acres into one of the great estates of America. His 56-room mansion dwarfed most of England’s stately Tudor homes. His 300-foot yacht roamed the oceans and bought back medieval French & German stained glass, Moorish stone carvings, Egyptian tile, Turkish rugs, and elaborately sculptured woodwork from Grandee’s palace in Spain. Hiram Manville married his only daughter, Estelle, to the King of Sweden’s grandson, Folke Bernadotte, in Saint John’s Episcopal Church, in Pleasantville, in 1928. About one thousand guests attended the reception here. Bernard Baruch honored the couple at a dinner in New York. President Coolidge honored them at a reception in the White House. Folke Bernadotte was assassinated in Palestine (Israel) while serving as a United Nations mediating team ambassador from Sweden in 1948. He was the first official mediator in the U.N.’s history. His appointment followed the violence resulting from the U.N.’s partition plan for Palestine and Israel’s unilateral declaration of independence. He was able to establish an initial truce during the subsequent 1948 Arab-Israeli war. Estelle died in 1984. She had been a crusader for the International Red cross, the Girl Scouts, and many other philanthropic organizations. Manville bred race horses in his stables beyond the tennis courts. He raced them on his private track. And every year he would import a tribe of Indians from New Mexico. When they pitched their teepees next to the swimming pool, Manville piped in gas and water to make them comfortable. One year, he brought a team of lumberjacks down from the North-woods to build a log cabin near his mansion. He needed a place to display his hunting trophies and relax with friends. The Manville’s loved their land. While Mrs. Manville developed hybrid tea roses, Mr. Manville created a virtual arboretum with the help of Rosario Scuderi, his Chief Groundskeeper. Italian stonemasons came to create garden walks, walls, and terraces. But rare trees and shrubs came from all over the world to join the Native American maples, oaks, elms, spruce, pine, and birch trees. The result is Hiram Manville’s most enduring dream. A retreat set in the rolling hills of Westchester County’s Pleasantville. Read the History of Pleasantville here. 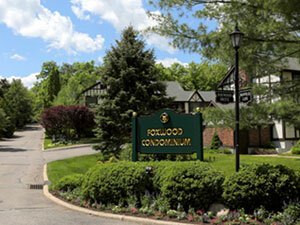 Learn more about “Tudorbethan architecture” that comprises Foxwood Condominiums today.